Fall Harvest Pop-Up with Tiny Pies features Amanda Bates and Kit Seay, the mother-daughter duo behind the brand. 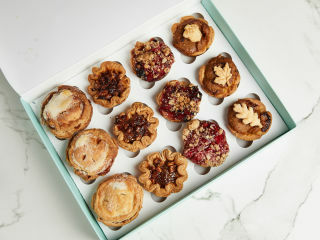 They will be producing and selling their signature “tiny pies” at the pop-up. Coinciding with the Texas Farmers Market at Mueller, customers can come by to pick up both pies and ice creams to make pie a la mode. Pies will be sold individually, with or without ice cream, or in half-dozen boxes in the shop. The event is first-come, first-serve and, ends when the pies sell out.